Trash to treasure: how can we extract valuable resources from production waste? Greek scientists have developed a technology that allows them to obtain rare earth elements (REEs) from waste ore in an economical and environmentally friendly way. 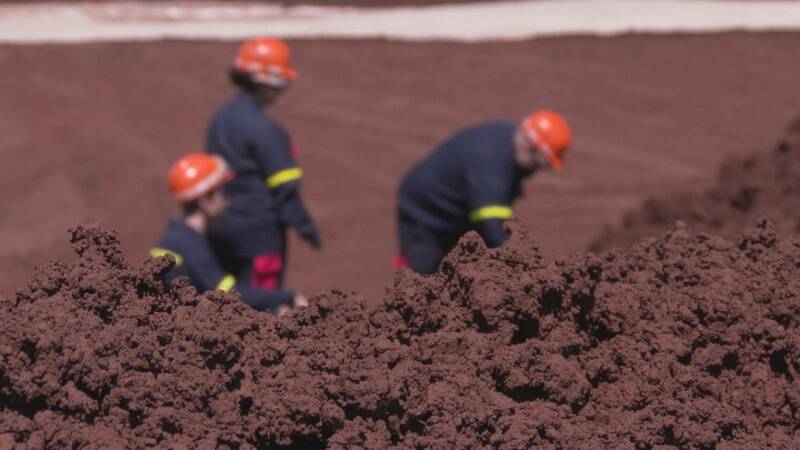 For every ton of alumina, the Aluminium of Greece plant in Agios Nikolaos – near the large bauxite deposits at Boeotia and Phocis – produces a ton of bauxite residue, making around 2,000 tons of the heavy red mud every day. Although it has long been discarded as waste, hidden in this soil lie microscopic particles of REEs. Despite their name, rare earth elements are relatively plentiful in the Earth’s crust. They are not particularly rare, but they are difficult to separate from eachother. They are immensely valuable and, even in small quantities, they can drastically change the properties of materials. This makes them irreplaceable in the manufacture of wind turbines, cars, computers, smartphones and other high-tech applications. What is needed is a cheap and clean way to extract these coveted elements. It’s one of many goals of a European research project that looks to alleviate Europe’s total dependence on imported rare earths. Engineers in Athens have developed a simple method to dissolve and remove rare earth elements from red mud. Professor Ioannis Paspaliaris, a mining and metalurgical engineer at NTUA and EURARE project coordinator said the method he and his team are working on is as economical as it is environmental. “The major advantage of this process is that it can take out rare earth elements selectively. It doesn’t dissolve the whole solid matter — just the elements that we require. That is an economical and environmental advantage,” he said. The key is using an ionic liquid rather than more traditional solvents. Iconic liquids are molten salts that can stay liquid at room temperature. PhD student at NTUA School of Mining and Metallurgical Engineering Panagiotis Davris told Euronews how the process works. “We pour the bauxite residue into the reactor that contains a solution of ionic liquid. The way this leaching works is similar to making tea or coffee – you basically extract the components you need,” he said. It takes a couple of hours for the rare earth elements to completely dissolve in the ionic liquid. The mix is then filtered to remove the solid residue that can later be recycled. Finally, some acid is added to restore the ionic liquid back to its initial state, ready to be used again. What’s left is a valuable extract of rare earth elements. These powerful “solvents of the future” can be individually designed, with their chemical properties fine-tuned, opening a way to a more sustainable use of fossil resources.